Cork leather is a fairly recent innovation made by blending cork with other materials and is becoming very popular in the marketplace. When created, the product that is produced is soft, supple, flexible and durable. It is easily cleaned by wiping it with a damp cloth just as you would with leather. The great thing about cork leather, is that it is environmentally friendly and is just as durable as regular leathers. Naturally, cork leather is also water proof, stain resistant, dust, dirt & grease repellent. Some uses for cork leather in today’s marketplace: accessories, wallets, watches, bags, purses, furniture, yoga mats, clothing, shoes and wall coverings. I suppose it could help to sound proof a room as well if used on the walls. I’m not sure about wearing it as clothing yet, maybe some cork leathers are thinner and more flexible than others. Portugal is one of the top exporters of high quality cork leather and cork products. 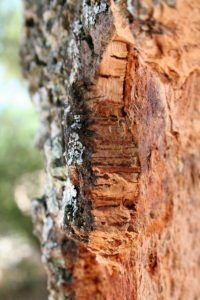 Cork is the phellem layer of bark tissue primarily harvested off the cork oak tree of southwestern Europe and northwest Africa. Cork is only extracted from early May to late August, when the cork can be separated from the tree without causing permanent damage to the tree. The first removal occurs when the tree is approximately 25-30 years old. The first harvest usually produces poor quality cork used for flooring, shoes or industrial products. After 9-13 years, another extraction can occur. This is more likely to produce a higher quality cork. The extractors use a very shape axe type tool to cut the cork off the tree. They need to be careful and precise not to damage the underlying layer of the tree to prevent harm to the tree itself. Once peeled off, the sheets of cork called “planks” are carried by workers through the forest and shipped to factories where they are left to dry and later processed.